Semi-desert. Wet, shady, canyon bottoms. Spring. Behind the Rocks Wilderness Study Area, Utah, October 26, 2012. 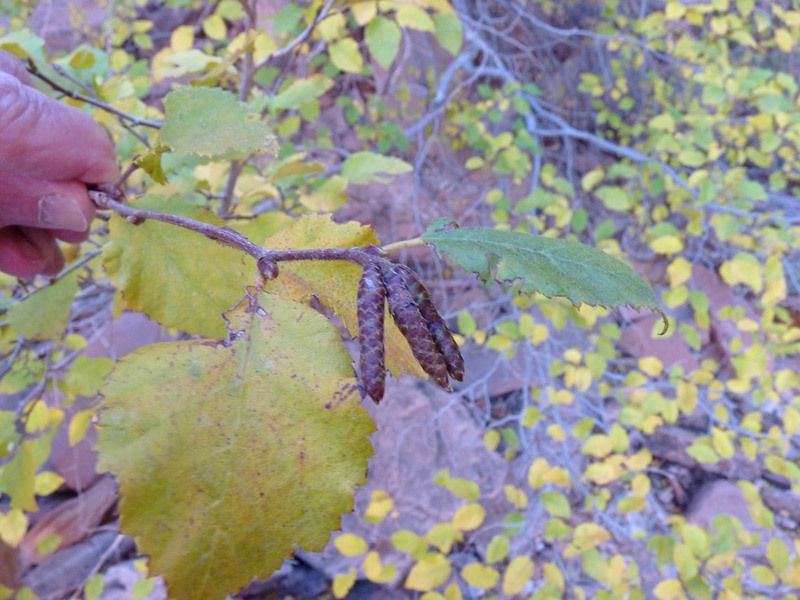 Ostrya knowltonii late fall yellow leaves stand out in the canyon bottoms that it favors. 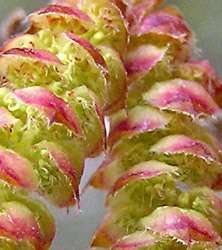 Male catkins form at branch tips in the summer and persist through the winter; female catkins will grow in the early spring about the time leaves begin growing. Semi-desert. 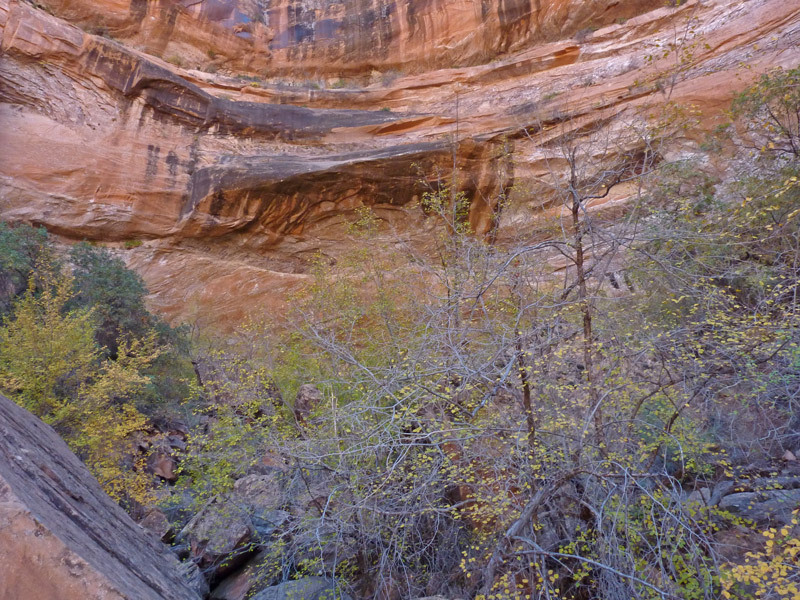 Wet, shady, canyon bottoms of Southeast Utah and Northern Arizona. Spring. Behind the Rocks Wilderness Study Area, Utah, April 23, 2006. 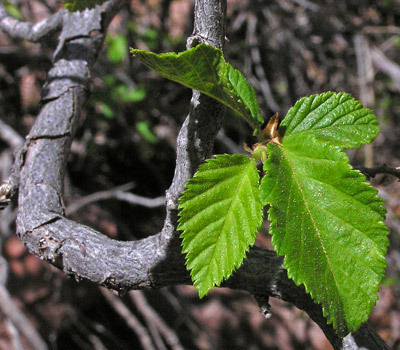 Western Hop Hornbeam is a rare tree in southeast Utah and is otherwise found only in northern Arizona and a few scattered areas of southern New Mexico and Texas. 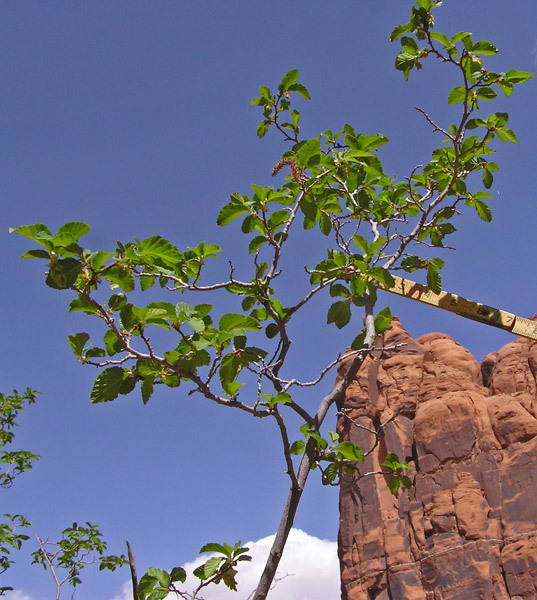 The tree is quite prominent on the Chesler Park Trail of Canyonlands National Park where hikers walk through the narrow Breezeway before descending into Elephant Wash. 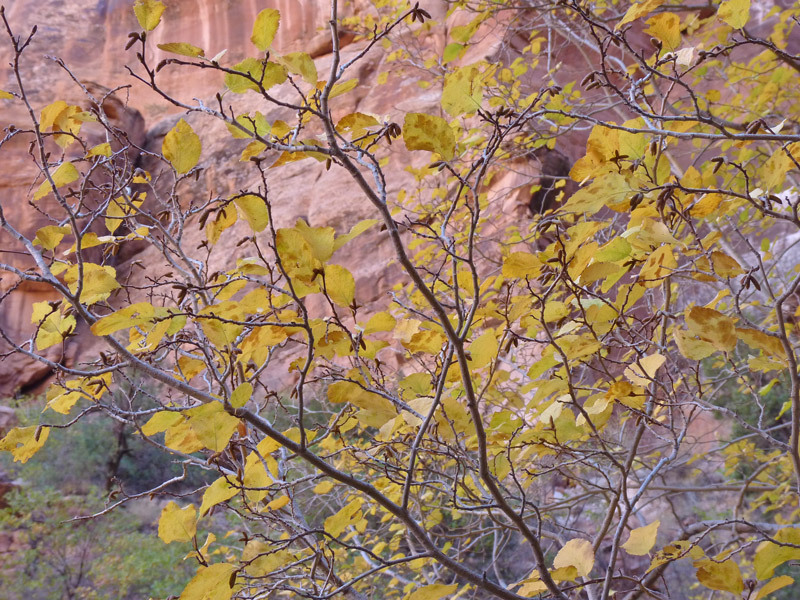 The tree is also even quite abundant in moist, rocky canyon bottoms near Moab, Utah. In the picture at left, the maturing green seed pods on the female catkins (far left) resemble those of hops (various vine Humulus species). 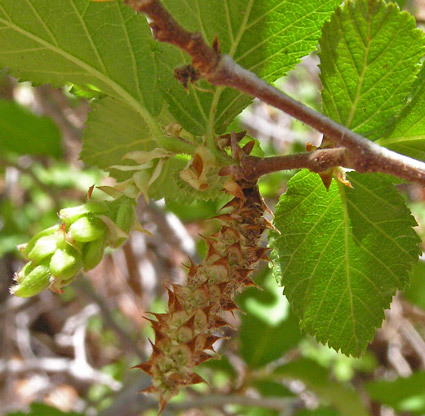 The male pollen-bearing catkin is in the center of the photo and is also shown in the next photographs. Since male and female flowers are separate but on each tree, the tree is termed "monoecious" (Greek for "one house"), in contrast to "dioecious" species which have male and female flowers on separate plants. Behind the Rocks Wilderness Study Area, Utah, April 16, 2008. These long, fresh, male pollen catkins have just opened and tiny stamens protrude. 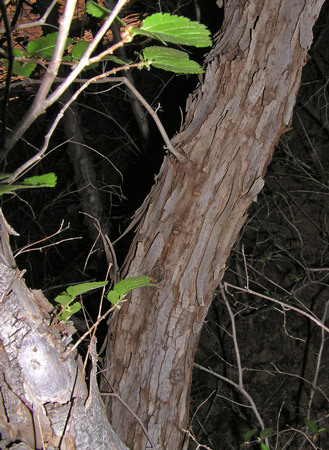 Bark on younger trees is gray, with darker, slightly raised, longitudinal ridges. Mature bark is shredded, as shown in the photograph below of a five inch diameter trunk.